Renovated elegance and revitalisation with style. The magnificent hotel Hospes Puerta de Alcalá, in the exclusive Salamanca district, is the only hotel located in front of the famous Puerta de Alcalá, in the historic center of the Spanish capital. This elegant 5-star hotel occupies a nineteenth-century mansion that served as a private residence before, but is now adapted to the needs of a contemporary hotel, with an excellent service and a unique atmosphere. Its luxurious and comfortable 41 rooms are decorated in a modern and contemporary style overlooking the hotel courtyards or with views to Puerta de Alcalá. The hotel has multiple spaces, each one with its own style and personality, highlighting the elegant Senzone restaurant with its large terrace, which invites you to meet and be delighted by the unique flavors of Madrid and the famous Spanish tapas. Guests can also enjoy a drink or relax in the Patio Chill Out inside the hotel. Hospes Puerta de Alcalá offers their customers free access to the Bodyna Spa, a space with 4 massages and treatments rooms, soundproof relaxation room, hammam, gymnasium and a relaxation pool great for a revitalizing moment. In addition to the Spa, the hotel offers a selection of amenities such as free Wi-Fi throughout the hotel, 4 private meeting rooms, library, hairdresser, business center, parking and other services such as free bike rental. 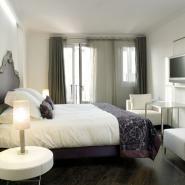 Enjoy the hotel's proximity to the Parque do Retiro and to the Puerta de Alcalá, two of the main attractions of the city. Only a few steps from this historic luxury hotel, other attractions deserve your attention, such as the Museums of Prado, Reina Sofia and Thyssen Bornemisza, the famous Serrano Avenue, also called the "Golden Mile" of Madrid, Puerta del Sol, Cibeles Fountain and the lively Gran Vía. Hospes Puerta de Alcalá is located on the Plaza de la Independencia in the centre of Madrid.y>Once in Madrid, follow on M30 road and exit to Calle Alcalá (exit 6) towards the centre of the city. Continue along Calle Alcalá until arriving at Plaza de la Independencia where the hotel is located.